This CD is crammed full of world premiere performances and scintillating playing. These two violinists have inspired some wonderful new works to be written by Australian composers, and hence this first-ever recording of Australian music for two violins, ranging from the raunchy title work by Matthew Hindson to the starry-eyed dreaminess of Mary Finsterer’s Spherica I. You'd be surprised what just two violins can do. Natsuko Yoshimoto and James Cuddetord. formerly the upper half of both the Australian String Quartet and Grainger Quartet, have long commissioned more than their fair share of inventive, witty and often very beautiful Australian duets. This excellent disc presents the final fruits of their joint mission and the array is diverse. Echoes of folk music appear in Stuart Greenbaum's Danny Boy Variations and Andrew Ford's affecting pair of works, balanced by Cuddetord's sober memorial to the victims of the 2004 Boxing Day Tsunami. Roger Smalley and Elena Kats-Chernin both turn in sets of neat miniatures alongside a clever Compossible by David Harris. For me, however, the standouts are the opening and closing tracks. Matthew Hindson's titular piece is hedonistic and energetic, maturely fusing his early attraction to pop music with new sonic complexities. By contrast Mary Finsterer's Spherica No 1 is ethereal and otherworldly, the violins spinning a careful web of glistening harmonics. Cuddeford and Yoshimoto were married at the time of this recording and the disc is by default a powerful portrait of their lengthy musical and personal partnership. The pair sound highly attuned to each other, almost as if playing a single instrument. which makes their subsequent split rueful indeed. The recording itself is beautiful and crystalline, a testament to the talents of Tall Poppies head Belinda Webster who recently received the coveted Don Banks Award for her longstanding efforts. Discs of this calibre justify the honour. This talented violin duo has sought to redress a lack of Australian repertoire by commissioning, performing and recording new works. All the pieces on this splendid recording are premiere recordings resulting from the commissioning process. There is a broad range of styles, from the purely textural to the strongly rhythmic or melodic. The CD opens with Matthew Hindson's piece Metallic Violins, which continues Hindson's engagement with popular culture. Emulating the sounds of heavy metal, the piece "shreds"! Technically demanding on the players, this is an exciting "overture" for the CD. A marked contrast to the density of the Hindson is Roger Smalley's Suite for 2 violins. Lyrical and airy, the 5 movements explore different territory. Three of the movements are linked to dance forms, while the other two are built on melodic canons. James Cuddeford contributes a piece, Concealed Waves, influenced by witnessing some of the devastation of the 2004 Boxing Day tsunami. Waves of sound wash over each other in varying degrees of turmoil. popular Irish song, progressing from strong and pulsing to quiet and ethereal - perhaps mapping the transition of the song's singer across the veil of Death. Elena Kats-Chernin offers one of her popular "Rags" and a tango. Andrew Ford's Lullaby and Fire Dance are markedly different - the first whisper quiet and floating, the second vibrant and rhythmic. David Harris's Compossible XIV offer contrasts of timbre, dynamics and playing styles, incorporating microtones and a broad range of extended techniques. Broken into textural sections, downward sliding glissandi become a dominant textural element. The last quarter of the piece features meshed glissandi (up to four parts) between the two instruments moving incredibly slowly. The effect is particularly striking. The CD concludes with Mary Finsterer's Spherica 1. Built almost entirely from natural and artificial harmonics, the piece is delicate and evocative. The technical demands of the pieces test the technical skill of Cuddeford and Yoshimoto, who breathe fire and excitement into these new works. It is inspiring to see an ensemble take responsibility for the creation of a new Australian repertoire, and this is certainly a fascinating collection of pieces. 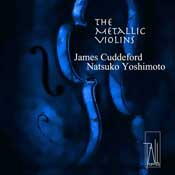 This CD of Australian music for two violins finds James Cuddeford and Natsuko Yoshimoto in top form. Yoshimoto is currently Concertmaster of the Adelaide Symphony Orchestra, while Cuddeford is Concertmaster of the Hong Kong Sinfonietta. Many of the works were commissioned and all were given their world premiere by the duo. The album takes its title from Matthew Hindson's The Metallic Violins. Adapted from a solo violin work, it references heavy metal guitar. Composer and pianist Roger Smalley penned Suite For 2 Violins, a compelling and skillful five-movement suite based on various canons. Cuddeford proves himself an adept composer with a rolling piece titled Concealed Waves. Mary Finsterer contributes a delicate work: Spherical. Duos by Elena Kats-Chernin, Stuart Greenbaum, Andrew Ford, and David Harris are also featured, The disc is a virtual 'how-to' of interpreting contemporary violin music. Cuddeford and Yushimoto's nuanced playing is in turns dazzling and exhilarating, then subtle and graceful. The ensemble work is flawless. “MANIC, wild and over-the-top” heavy metal music inspired Matthew Hindson’s title piece on this CD of music for two violins written or adapted for Brisbane-born violinist James Cuddeford and Natsuko Yoshimoto. Its music extends and challenges them to explore beyond customary limits of violin technique and style. Yoshimoto and Cuddeford are well up to the task. Graduates of Yehudi Menuhin School in England and other notable music institutions in Europe and USA, both play 18th century Nicolo Gagliano of Naples violins. Their musical synchrony is razor sharp in this world premiere recording of eight pieces by Australian composers. Apart from Canto. Homage to Ferrucio Busoni, a movement in Roger Smalley’s Suite for 2 violins, there are few lyrical comforts in the collection, yet the more you listen, the more you enjoy the sweep of technical extremities, the intersecting spheres of sound, the lush textures the two instruments and this music produce. Eerie soundscapes, scratching, scraping, furious bustling, the playing on the edge of string and bow in Mary Finsterer’s Spherica I, Cuddeford’s own Concealed Waves, Hindson’s The Metallic Violins, Lullaby and Fire Dance by Andrew Ford and Compossible XIV by David Harris, are mesmerising. Stuart Greenbaum’s Danny Boy Variations is an edgy take on the tune. Yet amid this rich brew you welcome the familiar territory Elena Kats-Chernin creates in Peggy’s Minute Rag and Slicked Back Tango. Perseverance pays in a disc program like this. Violinists James Cuddeford and Natsuko Yoshimoto are great supporters of new, Australian music. This recent recording features new music from some of Australia' s finest composers. Most are short - Mary Finsterer’s Spherica I is the longest at a little over 12 minutes. Matthew Hindson's two-violin tribute to the heavy metal guitar solo, The Metallic Violins, is simultaneously wonderful and ludicrous. Roger Smalley's Suite for 2 Violins is more traditional and includes a lively jig. Cuddeford, who witnessed the devastating 2004 tsunami in Southern India, contributes Concealed Waves - a moving tribute to the victims of that tragedy. Stuart Greenbaum's Danny Boy Variations is light relief after the seriousness of Concealed Waves and the two pieces by Elena Kats-Chernin, Peggy's Minute Rag and Slicked Back Tango are typically flighty. Andrew Ford's Lullaby and Fire Dance is clever, accessible and beautifully realised, while David Harris's Compossible XIV investigates many of the violin's capabilities. Finally Finsterer's Spherica I, inspired by the work of 1st century astronomer Theodosius of Bithynia, uses harmonics and other devices to create an ethereal sound landscape mirroring the astronomical universe. Cuddeford and Yoshimoto are strong advocates far these works and play with verve and high musicianship. Tall Poppies Records are to be commended on this release, with its broad selection of fascinating, new Australian music. The repertoire for two violins, beyond Bartok and Bach, is pretty sparse and former Australian String Quartet members James Cuddeford and Natsuko Yoshimoto decided to do something about it by commissioning works from some of our top composers. The results can be heard on a new Tall Poppies release The Metallic Violins (TP207). There are eight works, including one composed by Cuddeford, Concealed Waves, which he dedicated to the victims of the Boxing Day tsunami which he witnessed when he was in southern India. The title track, by Matthew Hindson, uses heavy metal guitar solos as its inspiration, and to great effect. Rock music influences are also apparent in South Australian composer David Harris's CompossibleXl V, although this time it's the flange effect used by Jimi Hendrix on his guitar. Elena Kats Chernin has contributed a couple of her delicious short pieces to Cuddeford and Yashimoto's collection Peggy's Minute Rag and Slicked Back Tango. Two works by Andrew Ford, who composed an inaugural work for the husband and wife team when they formed the Grainger Quartet, also charm the listener one a lullaby written for a friend and the other a very lively Fire dance. The most substantial work on the album is Roger Smalley's Suite for 2 violins, in five small movements, one of which pays tribute to Feruccio Busoni and another which features a penny whistle tune written by the composer's eight year old granddaughter. Melbourne composer Stuart Greenbaum weaves in phrases from Danny Boy in his folky set of variations and the album finishes on a calm and celestial note with Mary Finisterer's Spherical a 12 minute piece which draws on the ideas of second century astronomer Theodosius and his work on the nature of spheres. All pieces are superbly played and recorded. They mark a valuable and entertaining addition to the repertoire. Five stars. James Cuddeford and Natsuko Yoshimoto have long played together in quartets and as a violin duo; now they lead orchestras far apart. This fine CD, mostly of commissions for the duo, epitomises their efforts to enlarge the repertoire for this fruitful combination. The programme starts with a flourish, Matthew Hindson's title piece evoking the heavy metal "shredding" technique, with sliding and scratchy effects put over at breakneck speed and with daunting precision. Smalley's Suite for 2 violins is a satisfying "probingly thoughtful work of much sophistication that draws out their ability to free the music from the strictures of time and allow it to enter a meditative dimension" [The Australian]. Cuddeford's own Concealed Waves, a series of wave-like swells in memoriam the 2004 tsunami which he witnessed, is consolatory rather than seeking to evoke the horrors of the event. David Harris' Compossible XIV takes the players into the realms of indeterminacy and microtonalities, with unusual textures and extrememly slow glissandi (c.f. Gloria Coates). Mary Finsterer's Spherica I ends this remarkable sequence with "ethereal harmonics" of a beauty which resonates in the memory. The impeccable, and always beautiful toned, playing on two Gagliano violins is matched by high recording and production standards, with biographies and fine colour photos of all concerned (no silly grins !) - all probably masterminded by Belinda Webster. This is a great CD to treasure alongside those of the Swedish Duo Gelland, which have enriched our perspecitve on the potential of contemporary duo chamber music. VIOLINISTS James Cuddeford and Natsuko Yoshimoto were a regularly performing duo until career demands took them in different directions. Yoshimoto is now concertmaster of the Adelaide Symphony Orchestra and Cuddeford plays with the Hong Kong Sinfonietta and Sydney's Ensemble Offspring. However, a lasting testament to their work together is this recording of nine new compositions by Australian composers. Most of the composers represented, including Matthew Hindson, Roger Smalley, Elena Kats-Chemin and Andrew Ford, wrote their pieces especially for these players. Hindson's Metallic Violins is the fun, flamboyant showpiece of the collection. It borrows the technique of "shredding" from heavy metal, in which guitar solos are played at breakneck speed. Stagy sliding and scratchy effects on both violins emulate an electric guitar in full flight. But what makes this piece work so well is the sumptuous finesse Cuddeford and Yoshimoto bring to it: they give it all the refinement of a Bach partita. Smalley's Suite for 2 violins is a probingly thoughtful work of much sophistication that draws out the true talents of Cuddeford and Yoshimoto: their ability to free the music from the strictures of time and allow it to enter a meditative dimension. They enter a beguiling Zen zone also in Ford's Lullaby, Cuddeford's own Concealed Waves and Mary Finsterer's Spherical. Throughout, the playing is extraordinarily polished.